I wonder if I'll be able to use Scouter Vegeta's crossed arms with this figure. I wish he came with his own. They will probably fit, but the color may not match perfectly. The original does look better, hands down. The colors were more saturated and it had shading. This one has dull paint, no shading and the boot tips are simply painted with no detail. They could've included crossed arms too! May still get it since it's a Cell Saga Vegeta. For that reason, I feel the original will retain it's value or drop slightly (temporarily). With Battle Damage Goku, I expect no less than a Battle Damaged Majin Vegeta. That IS his iconic look. 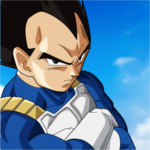 Could you provide a picture and show the difference between android saga and cell saga vegeta's? I like it! It's better than nothing! I do agree the paint is sharper with more detail on the original, but this is a fine follow-up and a good way of getting this mold re-released. Those boots should have the lines though...maybe it didn't look as good with the lines painted on, at the very least they could've done new sculpted boot-tips or not painted them at all. Kind of lazy there Tamashii! I've seen customs with painted lines that look alright. painted lines would be fine. Align the first line with the articulation break in the middle and then add a second one in front of it. problem solved, and they won't need to make new boot tips (but I wish they would). Welcome to the site! ToyzInTheBox, BBTS, MHToyShop and Eknight are all good places for preorders. I never had a problem with any of them. So far I have only seen bandaionline have it 2 of the 3 up for preorder. but I like eknight because I pay when its out. any idea if bandai does this? just saw this went live when I woke up! So stoked! No idea about Bandai, but I believe there are a few sites that do the "Pay when it's released" rather than pay when you pre-order. I can't recall off the top of my head, but the "Where do you buy Figuarts" from thread would be a much better place to get your information. EDIT: Actually those pictures Prodigy posted pretty much illustrate to me perfectly what the problem with the hair is. That light blonde look as opposed to the straight up solid yellow coloring that the figure has. To some it may seem nitpicky but if you're a completionist, it's not. My collection goal is to have as many characters as possible in as many outfits/variations that they can give us. Everyone's got different collection standards bro! Some people want to have only one version of Vegeta while others want every version, to each their own! rayd, the platinum hair is TRUE anime accuracy but it's almost never seen in action figures. Maybe one day they'll do it, but if they do I'd want ALL the Saiyans to get the same treatment. I'd rather have consistency in the line. Say there is two different vegeta figures, they have the same clothes, paint, detail, articulation etc... Except for one thing... One vegeta has a small black line across his back, and the other one doesn't. Would you pay 500$ for that figure if it was an SDCC exclusive? Nah man, you're missing the point. If that was a significant enough outfit that Vegeta wore where the line actually was a part of his look, then guess what? It's a different outfit!